This photo is perfect for this week's "Sepia Saturday" theme via http://sepiasaturday.blogspot.com. Thanks for the suggestion. I've added a link, and added the feed to my reader. The interiors of the few remaining men's "toggeries" where I live look much like this one. I like that. There's a feeling of trust and quality and refinement that department stores can't match. I bet the men in your family were sharp dressers. We had togs in another Sepia Saturday post recenty, now toggeries, and it appears they are derived from the same origin. I've never heard the word 'toggery' so I've learned something new. What a perfect photo for this week's Sepia Saturday theme! Welcome! I wonder who it is that we see inside the store by the counter? We're pretty certain it is the owner of the store, my great-great-uncle, David Cruvant. A classic old storefront, thank you for sharing. On behalf of Sepia Saturday, thanks so much for posting this fascinating old photograph. Hopefully you will join us again and again. Welcome to Sepia Saturday. Great picture! If my memory serves me right our previous "togs" were thought to be just swimming suits (in the UK?). The swimsuit usage appears to originate in Australia/NZ. The British and American definition is clothing. It's not a common word in America anymore, I'm unsure about England. I think togs has fallen out of use in England too but was quite commonly used 50/60 years ago. Glad you decided to link this to Sepia Saturday - it's just the sort of picture and item that we like to see. I already have a couple ideas relating to the previews for the next two weeks. While this photo was a natural fit for this week, I can see that I'm often going to have to get creative. But I like the challenge. Welcome to Sepia Saturday. That's a wonderful photo as your first post. There's so much going on in those windows. I can see that the owners were trying very hard to be creative with the merchandise. Very interesting photo. Welcome to Sepia Saturday. That's a great photo for your first post. So much going on in those windows. I love seeing all those boxes on the shelves. Wonder what was in them. A great photo to match the theme. I had never heard before of the term toggery, though I knew the word "togs" to mean clothes. I Love The Modesty of The Shopkeeper.He Lets his clothes do the talking.Welcome to Sepiaville! Barbara and Nancy - my suspicion is that the boxes lining the walls are filled with shoes. They appear to be of the right size and shape. My great great uncle was originally primarily a shoe salesman like his father. I suspect the store added other items as the years progressed, but shoes may have remained a large part of their business. I like the way both the outside and inside are clearly visible in the photo. We have an "old town" district near where I live and the storefronts are similar, yet not as charming somehow, as this photo. Thanks for joining us in our Sepian Explorations! Love this lovely old photo. The term toggery is new to me. Thanks for your contribution. 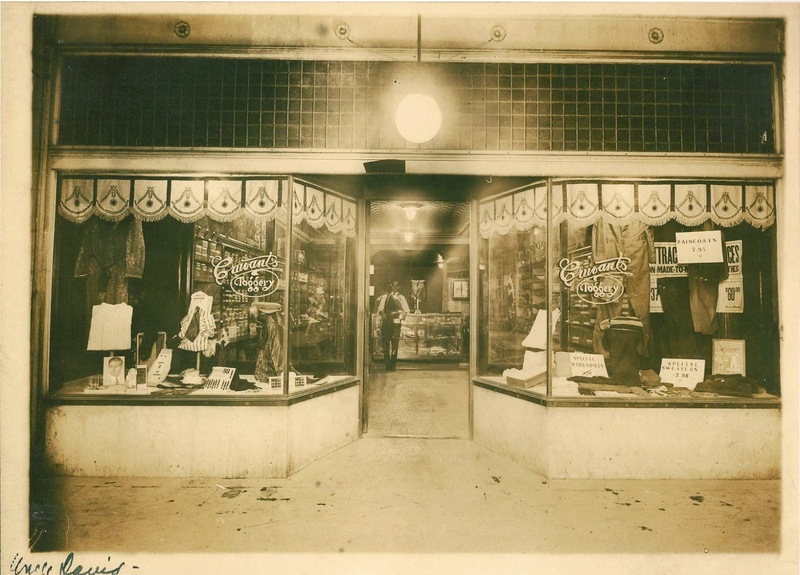 This summer we visited some locations in Denison, TX where my husband's ancestor had a clothing store. The building and the picture we have look much like this. The layout seems to have been the same everywhere. What a perfect photo to go with Alan's theme photo this week. Thanks for the new word too, I don't think I've heard that before!